Ginger is known for its health benefits and has been used for more than 5000 years in India. Ginger is a rich source of vitamins, manganese and copper, which are needed by the body to carry out its various functions properly. Ginger juice is consumed for treating various diseases and other problems of the body. How to Make Ginger Juice? To make ginger juice, you have to take ginger and peel off the skin. Now cut it into small cubes. Place the ginger pieces in a mixer, add some water and grind well. After you grind ginger, you have to take it out and strain it to remove all lumps to get the ginger juice. If you find it difficult to drink ginger juice alone, you can add some sugar to it. This will make it better to taste. Consuming ginger juice can helps you reduce acne and pimples. It also makes sure that the acne never appears on your skin in future. This is because of its anti-inflammatory properties. Ginger is great for providing you long and shiny hair. 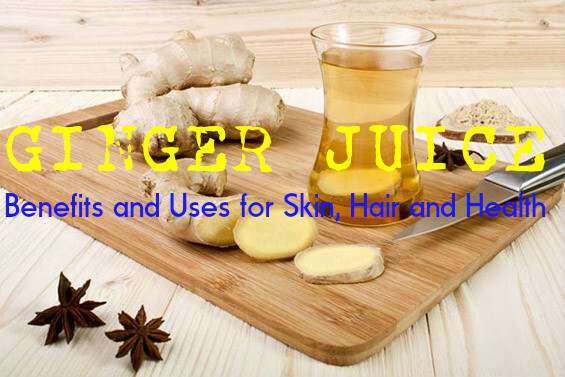 To get beautiful hair, you have to consume ginger juice regularly. You may also apply ginger juice on your scalp to get better results. When you apply ginger juice on your scalp, make sure that the concentration of water in the juice is less. Ginger is a good conditioner and helps in keeping your hair healthy and shiny. It can reduce dandruff on hair and make your hair grow fast. When you apply ginger juice on your scalp, you will feel irritation on the scalp. This helps in stimulating the flow of blood in your scalp. This in turn makes your hair grow well. Because of its anti-inflammatory properties, ginger is a good remedy for arthritis. It can reduce swelling and inflammation and thus provide relief to people suffering from thyroid or arthritis. Ginger has anti-inflammatory properties, which makes it great for reducing inflammations on the joints. A study made shows that people who consume ginger juice regularly suffer less from pain and other inflammatory issues. This is because ginger juice contains antioxidants, which can remove impurities in the body and increase the circulation of fresh blood. The process of ageing is increases with oxidative stress and chronic inflammation. These are the main factors that cause Alzheimer’s disease and age related cognitive decline. Studies made have shown that the bioactive compounds and antioxidants in ginger can prevent inflammatory responses that can take place in the brain. When ginger extract was given to 60 middle aged women, it was noticed that this improved the working memory and reaction time. Ginger is an effective blood thinner and this helps in reducing blood pressure in people suffering from high blood pressure. To lower blood pressure, all you have to do is to have ginger juice regularly. Adding some honey to ginger juice makes it tasty. Ginger is known for its antiviral and antifungal properties. This makes ginger very beneficial for treating cold, nausea and flu. Consuming ginger juice is a good way to cure cold. It provides you instant relief from cold and flu and also helps in killing the bacteria that are responsible for causing cold. The bacteria thus removed will never return to your body. Ginger is often consumed for improving digestion. It provides you relief from various digestive problems. It can help in speedy movement of the food from the stomach to the intestine. If you consume ginger regularly, you will suffer less from digestive problems and stomach pains. It can remove all impurities from the stomach and help people who suffer from morning sickness. Fresh ginger is a rich source of gingerol, which is a bioactive substance. It has the power to lower the risk of infections. Ginger juice can help in preventing the growth of many types of bacteria in the body. It is every beneficial for getting rid of oral bacteria that cause inflammatory diseases in the gums. Fresh ginger is also very effective for fighting against RSV virus, which can cause respiratory infections. Ginger is very effective for lowering he levels of cholesterol in the body. It can remove blockages in the blood vessels and ensure proper flow of blood, thus reducing the risk of heart attacks. Ginger is very effective for preventing cancer. It can also help in killing the cells that are responsible for causing cancer. A study made has shown that ginger has the power to slow down the growth of breast cancer cells. The anticancer properties of ginger are because of the presence of a substance called 6-ginerol in it. It is found in high amounts in raw ginger. Ginger is beneficial for providing you relief from all types of aches like tooth ache etc. It is also good for treating migraine, which has become very common nowadays. The pain relieving property of ginger makes it a favorite with people suffering from aches and pain in the body. Ginger being a good anti-inflammatory agent prevents the blood vessels from getting inflamed. As a result, there is an increase in the flow of blood to all parts of the body. This helps in curing pain. Ginger is also good for providing relief from menstrual pain. Now that you have seen the various benefits and uses of ginger juice, include it in your daily diet to remain healthy and fit. Make it a part of your skin care and hair care regime and you will have healthy skin and hair.